If your business is soliciting charitable donations, you may be required to have a Charitable Solicitation Registration issued in certain states. The general rule is that a non-profit conducting charitable solicitation within the borders of a state must register before soliciting funds from residents of that state. 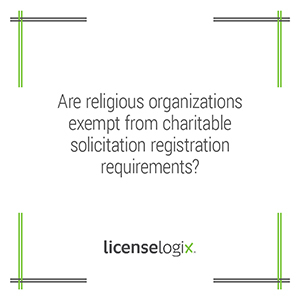 However, often the registration requirements in the Charitable Solicitation Acts do not apply to organizations incorporated for religious purposes and other organizations operated by a religious institution. The states have not adopted a uniform definition of a religious organization so the definition may vary state to state. Also, status as a tax-exempt entity does not necessarily qualify an entity as a religious organization. Exemption Registrations can be used by exempt religious organizations to solicit funds from residents of that state. LicenseLogix assists many non-profit organizations with their compliance needs. As a result, we truly understand the importance of cost-effective development and fundraising for non-profits. We will help religious organizations determine their exemption status and obtain all licenses and registrations, minimizing time-consuming and costly delays. For additional help you can fill in the form on the right or give us a call at (800) 292-0909. As licensing experts, we will streamline the entire licensing process, making it as painless as possible.